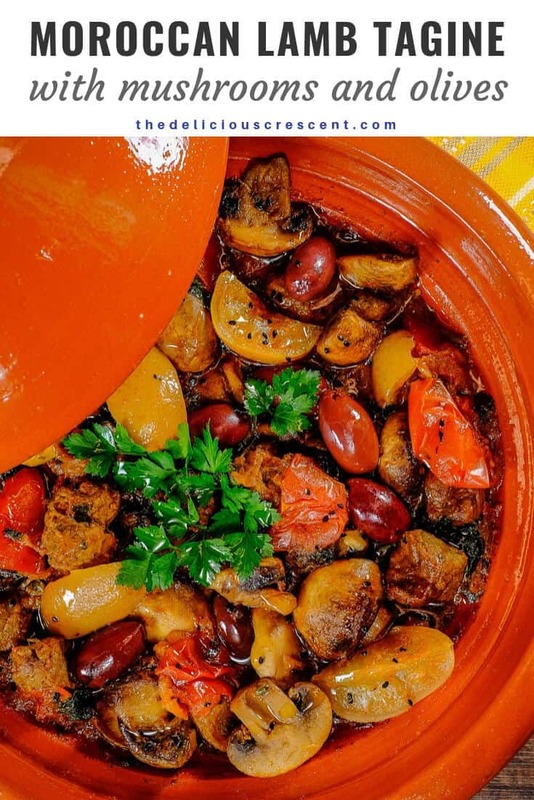 Lemony Lamb Tagine with Mushrooms and Olives is a Moroccan style dish with succulent earthenware stewed lamb loaded with healthy deliciousness – rich in flavor, high protein and potassium, low carb and calories, healthy fats, good fiber!! When I had visited Morocco, I was fascinated by this earthenware known as Tagine, which has a circular rimmed base and a dome shaped cover. 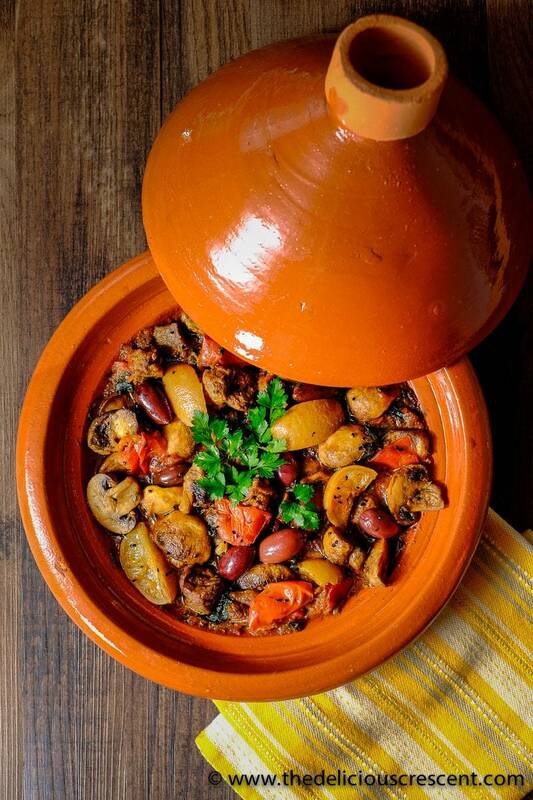 The stews prepared in this pot are also referred to as a “Tagine”. I am accustomed to using earthenware in the oven. But this Moroccan Tagine can be used to cook on the stovetop as well, provided one uses a heat diffuser over electric cooking ranges. The way earthenware acquires and retains heat is one aspect of cooking with these pots. But the other interesting characteristic is in the design of the cover, which allows for the condensation to return to the bottom. This concept facilitates cooking of the meat with its own juices and using minimal additional water, resulting in an amazingly succulent meat dish. There are certain rules to be followed when using earthenware. And several online resources offer detailed information regarding the “use and care of Tagine”. Along with the succulent lamb, there is much more to look forward to in this Lemony Lamb Tagine with Mushrooms and Olives. The meaty mushrooms and the tasty olives, all steeped in a nicely spiced lemony tomato sauce are topped off with fragrant herbs. Mushrooms are packed with nutrients and flavor. So you may love reading more about their nutrition potential in this fabulously easy recipe – Mushroom Spinach Red Pepper Kuku. Yet another cool recipe is my Mushroom Dumplings in Garlicky Yogurt Sauce. Now coming to the olives – aren’t they such a wonder fruit!! Apart from being the source of one of the healthiest and flavorful fat sources – olive oil, they are enjoyed as a snack, as pizza toppings and much more. The bazaars and markets across the Mediterranean, showcase their bounties as proud displays of the beautiful varieties of olives. In Morocco, this plentitude of olives has been also harnessed into the myriad kinds of olive based Tagines. Olives are very nutrient dense and a rich source of the heart healthy monounsaturated fats. The fermented olives are also a source of the gut friendly bacteria – lactobacillus. And phytochemicals are abundantly present in olives. Research studies with olive tree polyphenols such as oleuropein, oleacein and oleocanthal indicate that they may have some medically pertinent properties that include: anti-atherogenic, antihepatotoxic, antioxidant, hypoglycemic, antiviral, antitumor, anti-inflammatory and immunomodulator activities. Which implies that olives may be protective and preventive against a wide range of chronic diseases. 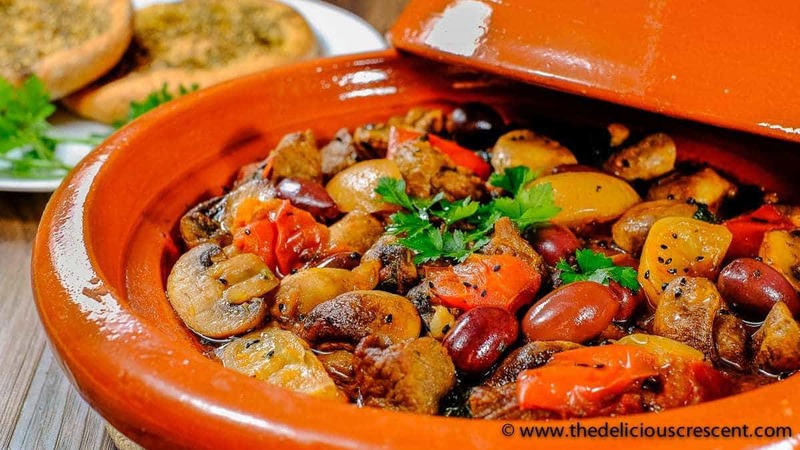 Now, if you want to venture out to try cooking some tagine in a Moroccan earthenware “Tagine”, give it a shot with this healthy concoction – Lemony Lamb Tagine with Mushrooms and Olives. Or you may still enjoy it with your same old cooking pot! Lemony Lamb Tagine with Mushrooms and Olives is a Moroccan style dish with succulent earthenware stewed lamb loaded with healthy deliciousness - rich in flavor, high protein and potassium, low carb and calories, healthy fats, good fiber!! The instructions below are for either cooking with a Tagine (Moroccan earthen pot) or a regular cooking pot. Take the tagine base and place it on a heat diffuser set over a stove. Put 2 tablespoons olive oil and heat it over medium to low medium heat for about 10 to 15 minutes, or more, until the oil is heated well. Add the sliced onion and sauté for 10 to 15 minutes. Then add one grated garlic clove and stir. Next add the lamb pieces and let it brown a little. The juices released will evaporate as the meat browns. Then add all the ingredients from ginger through parsley. Sprinkle some salt as per taste and about 1/2 cup hot water. Place the tagine top and let the meat simmer for about 1½ to 2 hours until the meat is tender. Half the way through the process check and add some hot water as needed to ensure that the sauce does not thicken too much and burn in the bottom of the pan. If using a regular cooking pot, the steps will be the same except that the heating times for the oil and sautéing of onions will be shorter. And the amount of water added for cooking the meat would be more - about 1 to 1½ cups. During simmering, make sure to place the tagine top or lid as applicable. While the lamb meat is simmering, toss the sliced mushrooms with one tablespoon olive oil, red pepper flakes, one grated garlic clove, a pinch of salt and spread it on a foil lined rimmed baking sheet. Roast the mushrooms for about 15 minutes or more until the juices are released, in an oven that has been preheated to 400ºF. When the lamb is well done, check the consistency of the sauce and evaporate it if too thin or add some hot water if needed. Then add the roasted mushrooms, black olives, quartered preserved lemon, lemon juice and stir. Adjust the salt, lemon juice and seasoning as per taste. Cover the dish with the tagine top or lid and let it simmer for about 10 minutes. Garnish with chopped cilantro. Transfer the dish to a dry wooden surface. If using a tagine to prepare this dish, remember that the heat from the hot tagine (earthen pot) will continue to cook and evaporate the sauce even after removing the dish from the stove. So you may turn off the stove and transfer the dish before it reaches your preferred final thickness for the sauce. Serve this Lemony Lamb Tagine with Mushrooms and Olives immediately. It goes well with some fresh baked flat bread. Ahh, I love lamb. This recipe sounds so delicious! I don’t usually go for lamb but it sounds delicious in this recipe! Yes some people find it too gamey in flavor. But I usually evaporate the lamb juices and brown it a little, so improves the flavor. 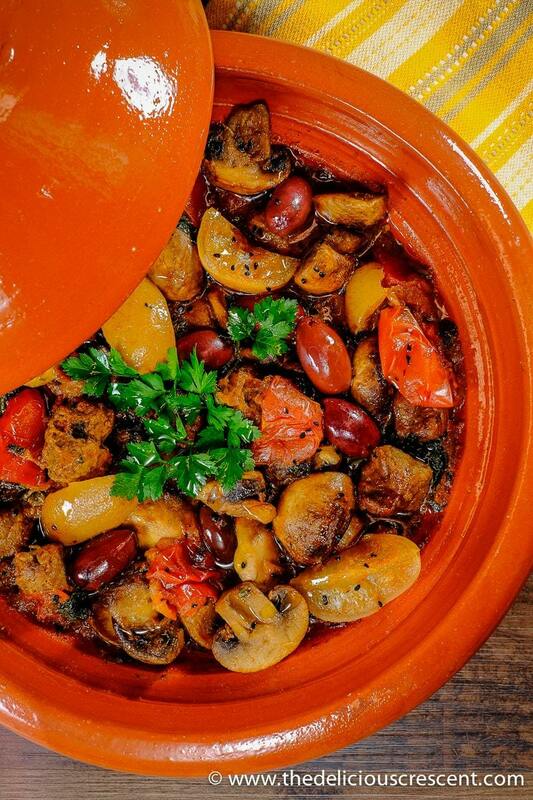 I LOVE Moroccan tagine, and this looks and sounds very delicious! I need to go and buy ras el hanout and make this. I can tell by looking at the ingredients that your lamb tagine is so flavorsome. I’ve always wanted to make this but I haven’t seen any that I want to make but yours look like it will work! Thanks April. Hope you enjoy making it. I’ve never made anything in a tagine but I’ve certainly eaten many things. 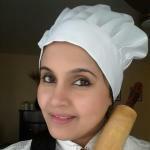 Your recipe has the most beautiful mix of spices and herbs. This must taste wonderful. Thanks Ginny. Its like cooking in the romertopf but on the stove.